The Vietnamese Case For Parks And "Walking Streets"
Visit Hanoi’s Hoan Kiem Lake around 7 a.m. on a Monday, and be rewarded with a delightful display of urbanism. 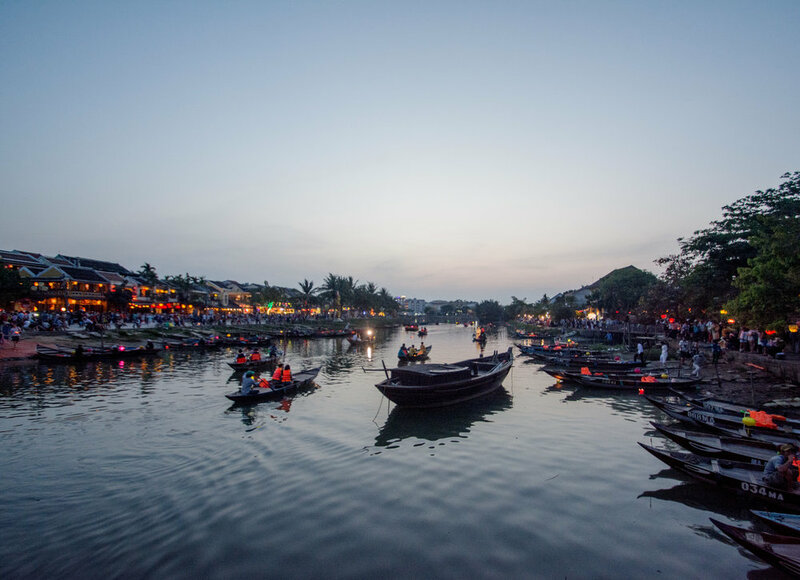 In the city center of Vietnam’s bustling capital, several hundred people gather to spend their mornings at this park, which—even including the lake itself—is only a mere fraction of the size of New York City’s Central Park. Hordes of people can be seen jazzercising, jogging on the park’s one-mile loop, swinging racquets in badminton tournaments, practicing tai chi at the water’s edge, sitting on one of the many shaded benches, and running to keep up with their leashed pets. But visit the very same park around 6 p.m. on a Saturday, and be astounded by an impressive feat of urban policy. Tens of thousands of people pour into the city center, pulled by the amazing appeal of Hanoi’s weekend “walking streets:” a series of streets around the lake that close to motorized traffic every Friday evening, and give pedestrians complete reign until Monday at midnight. Started as an initiative to boost tourism and promote awareness of local arts and culture in September of 2016, some of the most popular “walking streets” include the otherwise intimidating, five-lane, one-way Le Thai To encircling Hoan Kiem Lake, where most of the street performances, impromptu dance classes, and athletic displays of Double Dutch and Vietnamese version of tinikling can be found; Trang Tien, famous for housing Hanoi’s oldest ice cream parlor and enticingly cheap ice cream cones; and the “beer street” of Ta Hien, attracting locals and tourists with bia hoi, freshly brewed beer with the shockingly low price tag of 5,000 VND (approximately $0.22 USD) per glass. On the weekend, the streets around Hoan Kiem Lake become flooded with pedestrians enjoying a reprieve from the usual chaos of traffic; during the week, the busy roadway is a much less navigable realm for the would-be walker. Hoan Kiem Lake’s popularity on both weekdays and weekends points to the critical role of parks and public space in cities, big and small. Parks and public spaces supplement tight living quarters with free places to relax and spend time, a particularly important amenity when people sacrifice square footage to live in larger metropolises. They foster recreation and activity, helping visitors on the path to mental and physical wellbeing. Their lack of entry fees allows all people to enjoy what is rightfully a public asset, regardless of financial ability, educational achievement, or skin color. They provide spaces for people to gather, be it for informal purposes of enjoying a Saturday night with friends, or for the formal purpose of organizing holiday ceremonies and public awareness events. They offer coveted breaks from motorized traffic, giving pedestrians the rare chance to not have to compete with cars and motorbikes, and—when large enough—the rare chance to enjoy sounds of nature amid the cacophony of city life. And finally, in cities notorious for horrid air quality, parks and public spaces can protect the trees and plants necessary for carbon sequestration and give visitors a chance to breathe better air. Hoan Kiem Lake Park boasts an impressive tree canopy and ample space for pedestrians to wander. 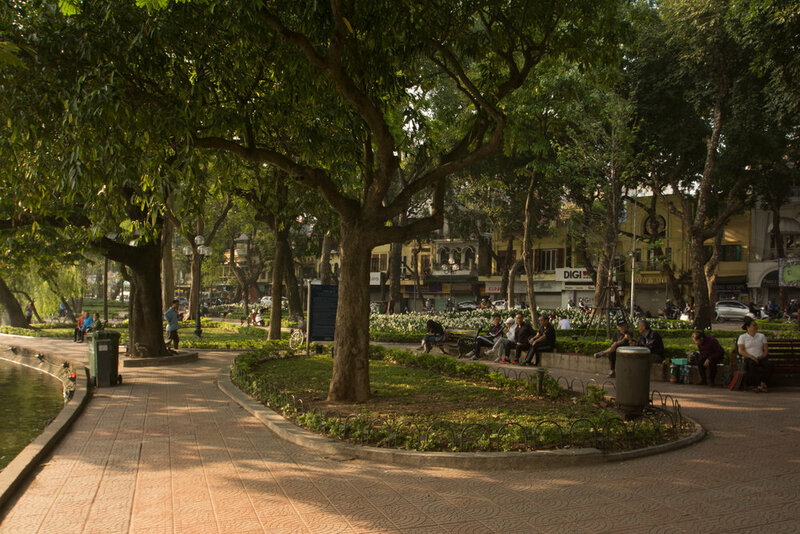 In addition to bench seating and space for street vendors, Hoan Kiem provides larger areas for recreation; on a given afternoon or evening, visitors can witness locals participating in everything from dance classes to badminton tournaments. Not all parks and public spaces are success stories. Throughout a tour of nine cities across Vietnam (Ho Chi Minh City, Vung Tau, Phan Thiet, Da Lat, Nha Trang, Hoi An, Da Nang, Hue, and Hanoi), trends emerged about the types of parks and public spaces exist in Vietnam, and what makes some more well-utilized than others. Among the traditional “parks”—places that are dedicated public green space every day of the week, every week of the year—two camps dominate: minimally landscaped nationalist parks with overt displays of political pride such as statues of Vietnamese luminaries and the national flag; and verdant parks with lush tree canopies, flowering plants, and ample benches. 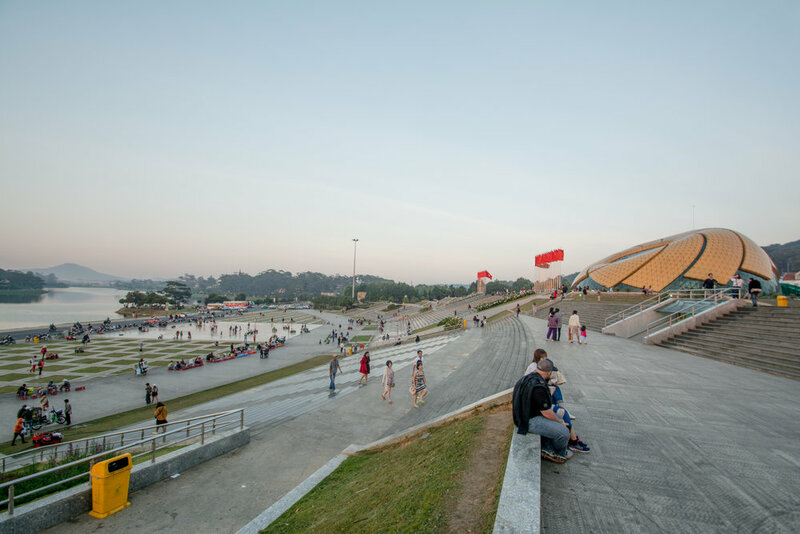 The former, such as Ho Chi Minh City’s Nguyen Hue and Da Lat’s Lam Vien Square, are largely desolate during the daytime due to their intimidating expanses of unshaded park space, and appear out of scale within their urban context. However, they prove popular destinations after sunset, when street hawkers keep the masses fed and children drive rented Big Wheels trucks in manic circles around their parents. Da Lat's Lam Vien Square is a sprawling, multi-level city park with outdoor recreation areas and an indoor entertainment complex. Like Nguyen Hue in Saigon it is an example of a large, capital-intensive government park project that, though impressive, is on a scale that may not be always compatible with its volume of use; and due to a lack of shade trees, Lam Vien sits relatively empty in the heat of the day. On the other hand, the more traditional “greenspaces” (such as Hanoi’s Hoan Kiem Lake) remain well-trafficked even during the heat of the afternoon, refreshing visitors with cooler temperatures and well-shaded seating areas. 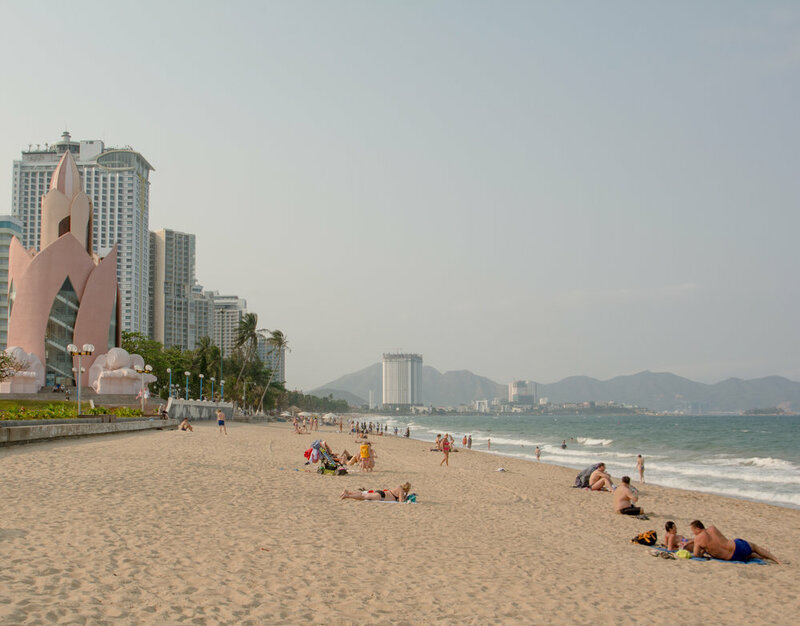 The coastal city of Nha Trang has adapted the urban park concept to its own context, protecting one mile of coastline with a public park buffer between the beach and the commercial strip. This linear park includes a paved walking path, benches, workout equipment, coconut palms, canopy trees, and priceless beachfront views. The park also helps insulate businesses, hotels, and residences on the adjacent road from the turbulence of storm surges and shifting sands; protect the beach from being consumed or privatized by unchecked development interests; and attract and retain visitors that wish to enjoy the beachfront under the shade of trees. 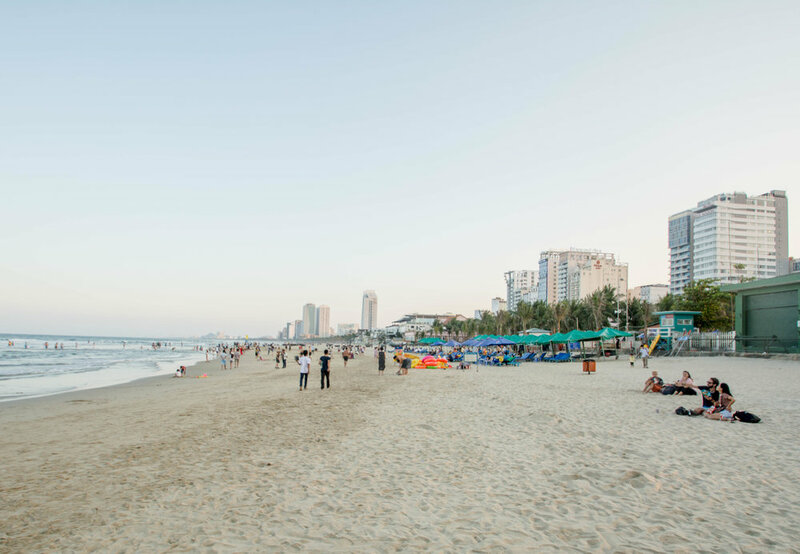 Both Nha Trang’s linear park and public beachfront, and a similar approach in the coastal cities of Vung Tau and Da Nang, are a stark contrast from Phan Thiet’s philosophy. A coastal beach town known for kitesurfing and large sand dunes, private resorts and developments claim the majority of Phan Thiet’s oceanside property. While the ocean remains open to the public with access points every few blocks, one of the city’s only proper public beaches is a small strip on the west side of town. Abutting a private resort, guards are sure to inform the public when they have overstepped the bounds of the public domain. 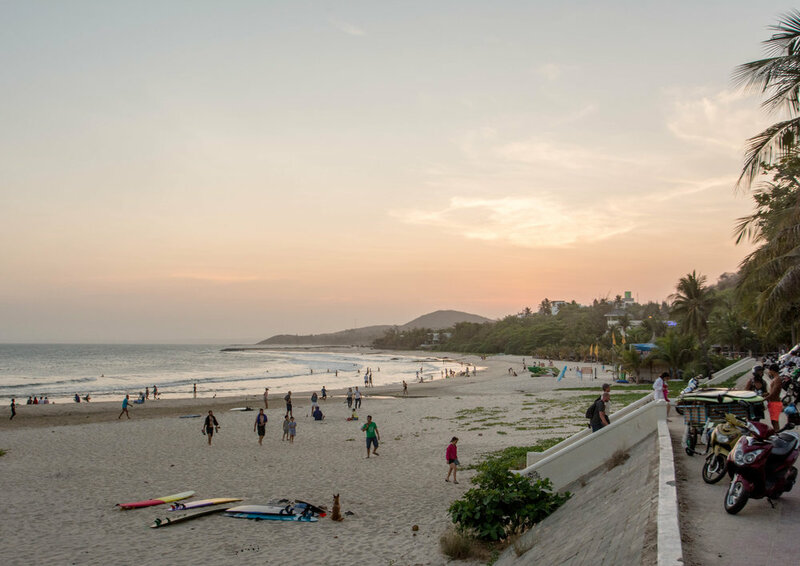 With no houses near to the beach and only one adjacent luxury resort, locals and tourists are forced to travel to enjoy an afternoon on the sand. With little buffer between developments and ocean, waterfront properties are even more vulnerable to the effects of typhoons and climate change. Given Vietnam's more than 2,000 miles of coast, beaches drive a significant share of the country's tourism. Many smaller resort towns like Mui Ne have allowed privatization to drastically limit the availability of public beachfront. Alternatively, Nha Trang and Da Nang reserve large swaths of beach as public parks while still allowing private parties to sell snacks or rent out chairs. The other category found in almost each of the nine cities visited are more flexible parks and public spaces—places that typically operate as streets for cars and motorbikes, but with blessings of urban policies, metamorphosize into massive stomping grounds for pedestrians. Contingent on days of the week and times of day, these “walking streets” (and in more bold cities, “walking towns”) also take two forms: those predominately catering to tourists and their wallets, versus those meant to appeal to the every day residents. Some pedestrian-oriented street closures are done primarily for tourism, without the cultural goals of Hoan Kiem's walking streets. 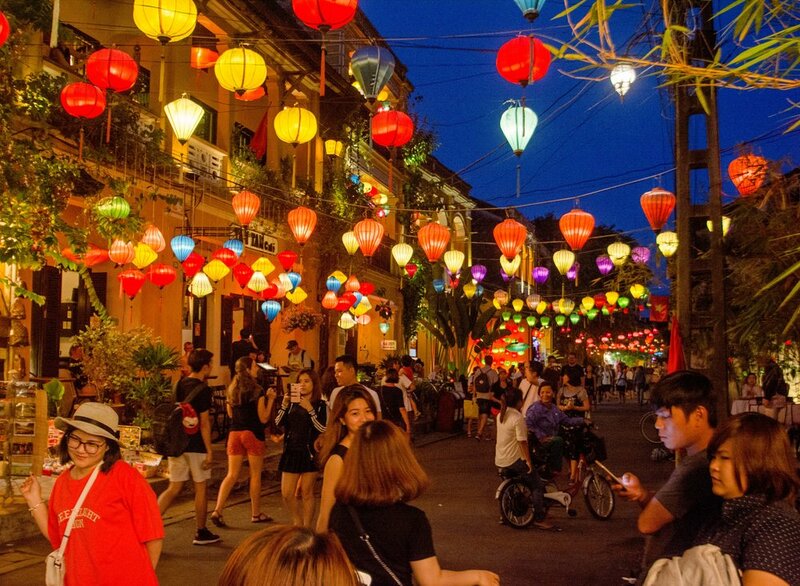 Hanoi's Hang Dao night market and Saigon's Bui Vien backpacker street are two such examples. Some of the tourist-oriented efforts simply involve street closures in backpackers’ districts, particularly focused on ridding streets with popular nightlife of motorbikes and cars to ensure the safety of tipsy travelers. Ho Chi Minh City’s bustling Bui Vien street, infamous for bars, clubs, and parties closes to motorized traffic on weekend nights, a similar tactic taken in Hue’s backpacking hub. Other tourist-oriented street closures make space for night markets, or blocks packed with pop-up stands boasting a large, if repetitive, assortment of souvenirs: elephant pants, banana jumpsuits, and knock-off designer accessories. 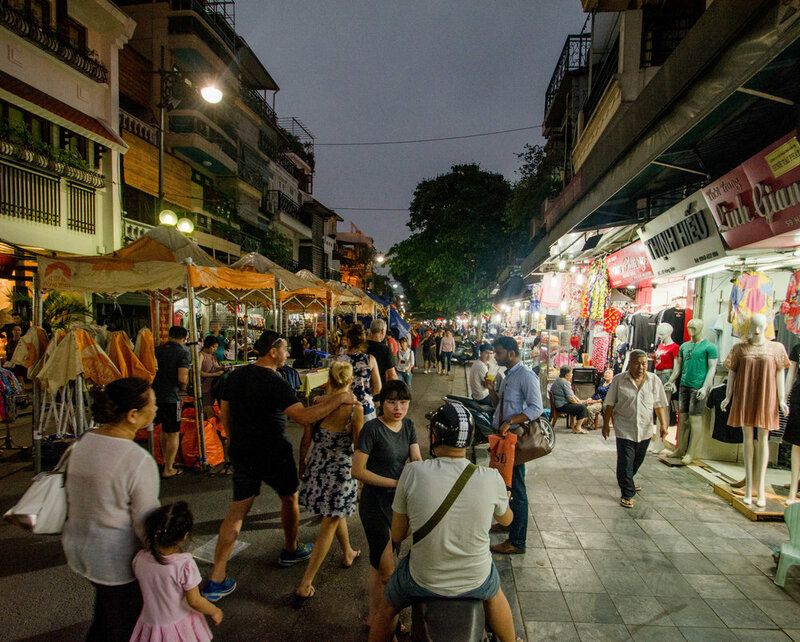 Excluding the vendors, locals are difficult to spot in Nha Trang’s or Hanoi’s night markets. Hoi An, an ancient port town on Vietnam’s central coast and a UNESCO World Heritage Site, restricts its core to pedestrian and bicycle traffic for most of the day. Undeniably an effort to create a pedestrian-friendly environment for the millions of tourists that descend upon Hoi An annually, the “walking and cycling town” preserves the historic, quaint aesthetic of the ancient city center, and makes it easier to imagine how the port might have functioned in centuries past. However, the traffic calming efforts do little to alleviate needs of local residents or create spaces that are the local hangout of choice—simply because little space is left in the old town once all of the tourists pack in. Da Lat, a picturesque former French town in the mountains of Vietnam’s Central Highlands, also converts its center into a “walking town” on weekend evenings. More than its tourist-oriented night market, the “walking town” offers an array of street food, sweet treats, and gathering space for locals. Popular among families, teenagers, and tourists alike, Da Lat’s “walking town” achieves a more balanced appeal among locals and tourists by keeping most of the public space empty of market stands, and free for street performances, meandering, and people-watching. Hoi An dedicates much of its core to pedestrians on weekend nights. The pedestrian-only sections help to preserve the centuries-old aesthetic of this UNESCO World Heritage Site and buffer the town's narrow streets against record-breaking tourist visitation. None of the parks and public spaces, however, compare to Hanoi’s Hoan Kiem Lake on the weekends. The city astutely deduced that the best way to cultivate awareness and appreciation of Vietnam’s culture and arts among tourists is to let them experience it subconsciously and perhaps unwittingly. Rather than experiencing an artificial representation of Vietnamese culture by purchasing elephant pants, matching fruit clothes, and fake Ray-Ban sunglasses at night markets, tourists and locals alike are invited to Hanoi’s city center on weekends to enjoy an undeniably thriving city, while still contributing to the local economy. Most importantly, they must do so on two feet—without the blur of a whizzing motorbike or the insulation of a car. Ho Chi Minh City’s desire to create their own motorbike-free city center seems like a no-brainer after experiencing Hanoi on the weekends—and residents are likely to thank them for it. “Walking towns” seem easier to accomplish in Vietnamese cities like Hanoi, Hoi An, and Da Lat, where transportation is ruled by motorbikes—a much more compact vehicle than cars. If most people in Hanoi arrived to Hoan Kiem Lake’s weekend festivities by car, the city would have a nightmare trying to find places to store the amount of cars needed to transport 20,000+ visitors. Once the city’s metro system opens in the coming months, Hanoi may begin to have even fewer motorbikes to worry about parking, and even more opportunities to embrace pedestrian-only spaces. It is imperative that places give people pleasant opportunities to experience their cities on two feet, be it in parks or on streets temporarily converted to walking zones. The popularity of parks and public spaces in Vietnam remind us that cities should not, and cannot, wait on efforts to build places for recreation. Their proven success also teaches us that we need not rely on infrastructure-heavy projects that are costly and time-intensive, but instead, look at our existing roads as assets for more than simply moving vehicles. With pilot projects and political will, streets can transform into havens for pedestrians. And for small to mid-size cities that hope to attract new residents and a young, capable workforce, the ‘walking street’ is a viable option to create places that people love. Why Are Vietnam's Streets So Active?